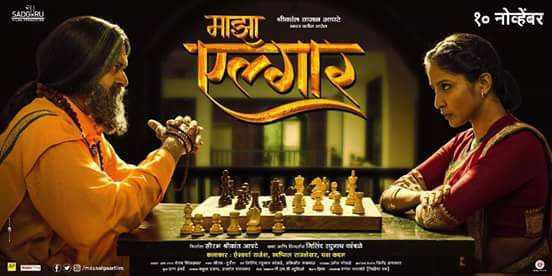 Swapnil Rajshekhar’s upcoming Marathi film Maza Algaar is all set to release on this Friday i.e. 10th November 2017 under the banner of Sadguru Films productions. The film is directed by Milind Raghunath Kamble and produced by Saurabh Shrikant Apte and presented by Shrikant Waman Apte. Apart from Swapnil the film is starring Aishwarya Rajesh and Yash Kadam. On the occasion of the film we decided to have a chat with Swapnil. Let’s see what he has in store for us. MarathiCelebs : Hello and welcome to MarathiCelebs.Com Swapnil. Tell us something about the film. Swapnil : Hi and thank you. The film is entertaining. It shows the struggle and fight of a girl who faces problems because of Mahant. As the name suggests Maza Algaar it justifies with the storyline. Co-Incidentally right now there are similar things, news in the society. So we can say it is a reflection of recent incidents. MarathiCelebs : Tell us something about your role. Is it different from your other roles ? 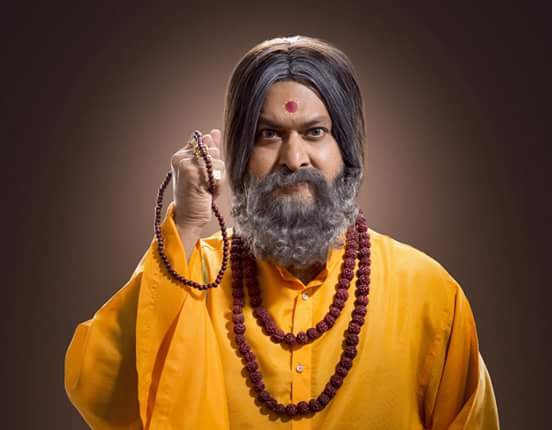 Swapnil : I’m playing Mahant. He is a main villain and I won’t say it’s only gray shade; in fact he is complete dark. He is very attractive, soft spoken but takes advantage of people’s faith. He uses spiritual path to influence people. He is highly ambitious and in order to achieve his goals he is not afraid to do the wrong things. This character has the characteristics of villain but it has one interesting thing that is, I have three different looks in the movie. Look was already decided and I just added one thing that we should add lenses to make it more impressive and we did it. So the character has green lenses. MarathiCelebs : That seems interesting. What made you do this role? What attracted you ? Swapnil : First of all as a commercial actor I like challenging roles. When I heard about this role I immediately decided to give it a shot because it is a main villain. Even if the character is not present in few scenes still you can feel his presence because of his impact on the whole story. Secondly I like to work with various looks. Here I got a chance to act in three different looks which increased my interest. MarathiCelebs : What will audience get to see in film ? Swapnil : Audience will get a complete entertainment. I won’t say that it should do some social awareness part and all but as we can see it is reflecting few serious issues in society. It is entertaining yet a reflection. 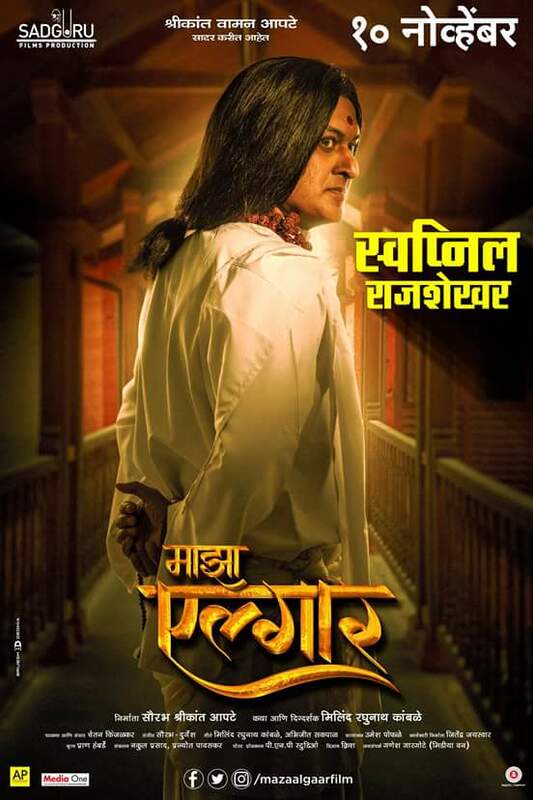 MarathiCelebs : What is the USP of the film in your opinion ? Swapnil : I would say the USP of the film is its strong storyline. Other than this we need good music and good photography to make film successful and here Maza Algaar has full marks. So it’s all and all a complete package. MarathiCelebs : Would you like to share any moments about the film? Swapnil : We were shooting in Kokan in April so weather was very hot. While shooting my scene used to be the first and last in the sequence. So once I took getup I had to keep it all day. We were shooting in a school where students used to come even in the vacations. 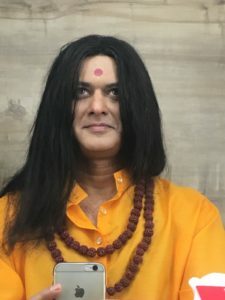 So whenever they or anyone saw me in makeup they used to come to me and I also used to start talking like an actual Mahant. I like to connect to people and it was fun and I became more close to my audience. MarathiCelebs : Would you like to give any message to audience ? Swapnil : We are presenting Maza Algaar on 10th November 2017 and I would like to tell everyone that please go and watch the film with your near and dear ones. You can reach me directly through my Facebook page. I would like to hear feedback from all of you. Thank you so much for talking to MarathiCelebs.Com Swapnil. We wish you all the best for Maza Algaar and your future projects.